THIS IS A REPEAT OF MY BLOG FROM MARCH 2010! I'm not Irish, my husband is not Irish, however we LOVE those boiled and spiced meats! I heard a soundbite on one of the Food TV shows over the weekend that in Ireland, corned beef is not the traditional food for St. Patrick's Day. It seems that lamb and/or bacon was consumed on this day in Ireland, along with cabbage and the ever-present potato. Both lamb and bacon are expensive, so when the Irish immigrants came to America and lived close to their Eastern European neighbors, they learned about boiled meats, like beef brisket, corned beef, pastrami, etc. These are less expensive cuts of meat. Corned beef and cabbage with boiled potatoes became the traditional St. Patrick's Day feast in the New Country. The other day I was at my fave store, Trader Joe's. I smelled this delicious, briny, salty, beefiness coming from the back of the store. It was after work...dinner time...I was starving! As I made my way to T.J.'s kitchen area, I saw tons of kids crowding around the counter, waiting for their mini corned beef sandwiches, served on T.J.'s corn rye bread. The store employee had a corned beef brisket simmering in an electric frying pan. 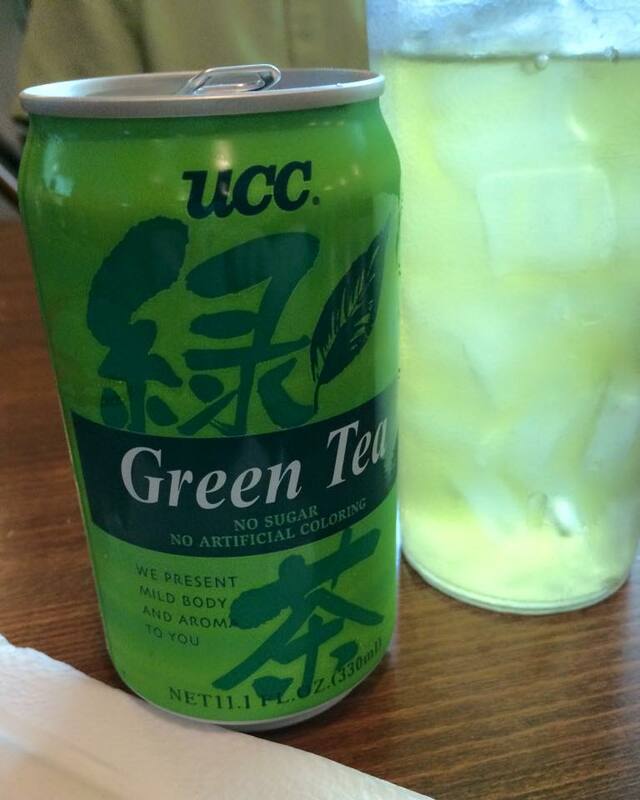 OK, I was hooked. I couldn't get near the counter for a sample, but I knew it must be delicious corned beef. I zoomed over to the fresh meat section and picked up a corned beef brisket to cook for St. Patrick's Day. I steamed the fully-seasoned corned beef brisket on Monday night...about 3 hours. Removed it from the pot and refrigerated it overnight. 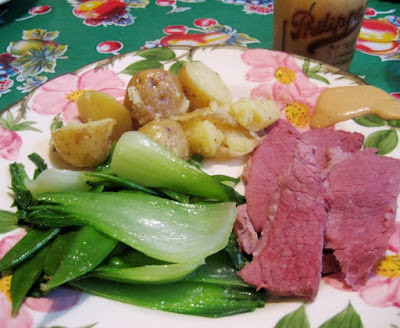 Last night we enjoyed our early St. Pat's Day feast of sliced corned beef served with Philippe's hot mustard, boiled potatoes and bok choy cabbage with some snap peas, along with a green salad. It was a divine dinner. Tonight, we'll have the left over corned beef in "sky-high" sandwiches on rye bread. A "sky-high" sandwich has cole-slaw inside the sandwich. I stopped by Label's Table Deli earlier today to purchase a bit of their great slaw and some fresh corn-rye bread. Yum!!! Last night we were Irish. Tonight we will be Jewish! I do love the melting (or stewing) pot that is America. Just in case you were wondering, it's not ALL about the food. From the History Channel Site: St. Patrick's Day is celebrated on March 17, his religious feast day and the anniversary of his death in the fifth century. The Irish have observed this day as a religious holiday for over a thousand years. On St. Patrick's Day, which falls during the Christian season of Lent, Irish families would traditionally attend church in the morning and celebrate in the afternoon. Lenten prohibitions against the consumption of meat were waived and people would dance, drink and feast—on the traditional meal of Irish bacon and cabbage. St. Patrick, the patron saint of Ireland, is one of Christianity's most widely known figures. But for all his celebrity, his life remains somewhat of a mystery. Many of the stories traditionally associated with St. Patrick, including the famous account of his banishing all the snakes from Ireland, are false, the products of hundreds of years of exaggerated storytelling. May the luck (and excellent food) of the Irish follow you today! My Beverage of Preference Today! I've got my simmering in the crockpot!